Indiana is currently split into two time zones. The official dividing line between the Eastern and Central time zones has progressively moved west from the Indiana-Ohio border to the Indiana-Illinois border. 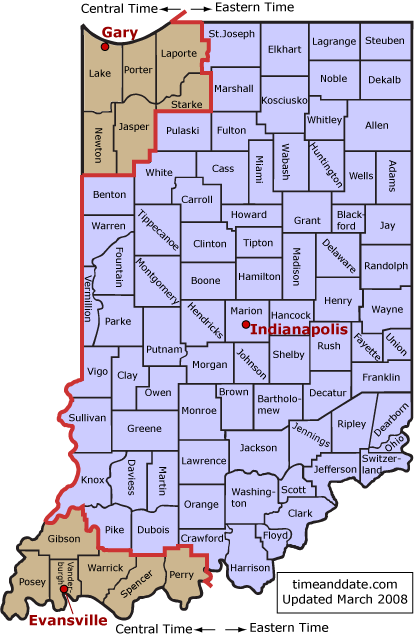 Eighty of Indiana's 92 counties follow the Eastern Standard Time and only 12 (Vanderburgh, Posey, Gibson, Warrick, Spencer, Perry, Lake, Newton, Jasper, Porter, Starke, and Laporte) counties observed the Central Standard Time.